The South Carolina DOT TAMP is available here. 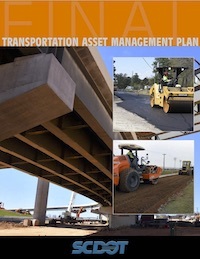 SCDOT's initial TAMP covers pavement and bridge assets on the entire state-maintain highway system. The plan was published in April, 2018. This document includes the following sections: Asset Valuation, Current Methods and Tools, Financial Plan, Future Demand, Introduction, Inventory and Condition, Investment Strategies, Lifecycle Management, Objectives and Measures, Performance Assessment, Process Improvements, Regulatory and Legislative Requirements, Risk Management.